The Arkema plant flooded by Hurricane Harvey was hit by a series of explosions Thursday morning. 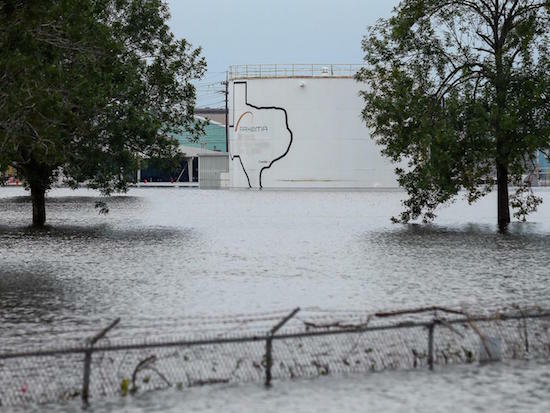 A flooded chemical plant outside of Houston suffered from a pair of explosions Thursday and could see more fires from eight other containers housing organic peroxide. “This is not a chemical release. What we have is a fire,” said Richard Rennard, an executive with Arkema Inc. near the plant located about 25 miles northeast of Houston. “Any smoke is going to be an irritant to your eyes, your lungs or potentially your skin,” he said, adding the company is encouraging anyone who has been exposed to the smoke to seek medical attention. Fire authorities said the plant suffered two small blasts and some deputies suffered irritated eyes from the smoke, but they emphasized the materials that caught fire shortly after midnight were not toxic. The plant, in Crosby, TX, lost power Saturday amid Tropical Storm Harvey, leaving it without refrigeration for chemicals that become volatile as temperatures rise. Arkema shut down the plant before Harvey made landfall. Rennard said the plant had four layers of security for refrigeration including backup generators, liquid nitrogen and cooling containers. He said chemical products in one of the cooling containers started to degrade, sparking the blast and fire overnight. Local officials said the blast sparked a 30- to 40-foot flame. People located in a 1.5 mile radius of the plant were evacuated. “What has happened is exactly what we expected was going to happen,” said Bob Royall, Harris County Fire Marshall. Rennard said there is a possibility of another explosion and fire occurring as the other containers continue to degrade. He said, because of the floodwaters, the company’s plan is to let the fires burn out. “It’s not over. This is a serious situation,” Rennard said. Arkema’s plant is required to develop and submit a risk management plan to the U.S. Environmental Protection Agency, because it has large amounts of sulfur dioxide, a toxic chemical, and methylpropene, a flammable gas. The plans are supposed to detail the effects of a potential release, evaluate worst-case scenarios and explain a company’s response. Arkema had warned of a potential explosion in an update on its website on Wednesday afternoon. Rich Rowe, its North America chief executive, said: “Our Crosby facility makes organic peroxides, a family of compounds that are used in everything from making pharmaceuticals to construction materials. “But organic peroxides may burn if not stored and handled under the right conditions. At Crosby, we prepared for what we recognized could be a worst case scenario. We had redundant contingency plans in place. “Right now, we have an unprecedented 6ft of water at the plant. We have lost primary power and two sources of emergency backup power.